Donald Delaware worked for Sunland Beef Co. in Arizona. He was in charge of processing hides. In October of 2004 the 71 year old took a bathroom break. The last thing he remembers is standing in front of a urinal. Co-workers found him bleeding on the floor. He suffered a concussion and some loss of memory. He apparently passed out and fell backward, hitting his head on the concrete floor. Is this a compensable injury? The fundamental question is “why did he pass out?” Doctors could not pinpoint a cause. One consulting physician thought the fall was due to “micturation syncope” – a rather fancy way of saying “fainting while urinating.” (Note to male readers: you can add this obscure risk to the ever-growing list of bad things that can happen to good people.) If this diagnosis were conclusive, Delaware’s injury would not be compensable. Micturation syncope is not a work-related condition. However, another doctor said he could not be sure that the fall involved this specific cause. Ultimately, he stated, the cause of the fall could not be determined. Given these facts, the administrative law judge and the appeals court ruled in Delaware’s favor. (You can read the Appeals Court ruling here.) If something unexplainable happens at work and results in an injury, the injury is likely to be compensable. The benefit of the doubt always goes to the worker. 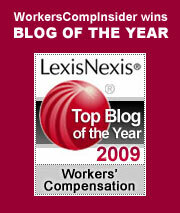 The burden of proof for presenting a specific diagnosis to rule out compensability falls on the employer. Where a definitive diagnosis might force Delaware onto his own resources, an uncertain or neutral diagnosis results in concrete benefits for the injured employee. One final thought. We have blogged with some frequency (here and here) the ramifications of an aging workforce. Mr. Delaware was 71 at the time of the fainting spell. I wonder how long he had worked at the company and how long he was planning to work. I wonder if his age had anything to do with the fainting spell. As the American workforce ages, we are likely to see a number of cases revolving around diagnostic conundrums: is it work related or is it micturation syncope? This entry was posted on Monday, June 18th, 2007 at 10:51 am	and is filed under Compensability, State News. You can follow any responses to this entry through the RSS 2.0 feed. Both comments and pings are currently closed.